Use a Realtor. Finding a home is a big job. A realtor can help you find a home based on your specifications, obtain information for you, and be your negotiator. The realtor's commission is paid by seller out of proceeds of the sale. Usually it is split between the buyer's agent and seller's agent, if both agents are involved. Use a Lawyer. Your lawyer will do a number of things including: perform a title search of the property, check for liens against the property, check that property taxes are up-to-date, handle the transfer of the ownership and the registration of the mortgage on title, ensure funds will be available for closing and that all mortgage terms and conditions are met. Meet with a Mortgage Lender. Get a pre-approved mortgage. Assess the property. An Appraiser can give you an accredited opinion about the market value of the property. A Home Inspector can point out problems about the home. If building a new home, get your Home Inspector in to check things out at an early stage. Builder’s Representative. This is the person you will likely speak to when you are buying a newly constructed home from a builder. Always read your contract and make sure to get everything agreed upon in writing. Costs. There are a lot of costs involved in purchasing or selling a house. Along with the Purchase price, there may be other costs such as: Lawyers Fees, Land Transfer Tax, Registration Fees, Compliance Letter, Tax Certificate, Provincial New Home Warranty Program premiums, Mortgage appraisal and application fees, Home Inspection, Land Survey, Title Insurance, Local utility connection charges, Property Tax and Prepaid Utilities Adjustment, and Interest Adjustment. Oh yes, and don’t forget house insurance! Contingencies. Most offers include two standard contingencies: a financing contingency, which makes the sale dependent on the buyers' ability to obtain a loan commitment from a lender, and an inspection contingency, which allows buyers to have professionals inspect the property to their satisfaction. Keys. 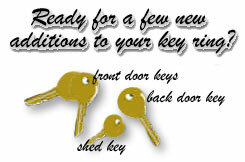 It may seem to take forever, but suddenly the day will arrive when you will be handed the keys to your new home. Copyright 2001-2009 www.Nicolson.ca. All rights reserved. A Lady Gnome Production.